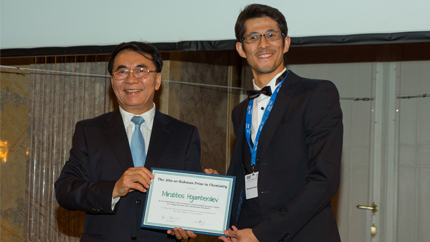 Fulbright Visiting Scholar Program alumnus Mirabbos Hojamberdiev from Uzbekistan presented with the 2015 Atta-ur-Rahman Prize for his contributions to inorganic chemistry. Fulbright Visiting Scholar Program alumnus Mirabbos Hojamberdiev from Uzbekistan received the 2015 Atta-ur-Rahman Prize for his contributions to inorganic chemistry. Dr. Hojamberdiev’s research aims at growing inorganic crystals that are able to generate hydrogen from water molecules, once they are hit by solar light. The award ceremony was held during the opening of The World Academy of Sciences (TWAS) 26th General Meeting in Vienna, Austria on November 18. The prize acknowledges talented young chemists who live and work in scientifically lagging countries. The prize is provided by Pakistani TWAS Fellow Atta-ur-Rahman, a leading scholar in the field of organic chemistry and a globally influential advocate of science education. Hojamberdiev has been working for over 12 years on different research projects related to the development of novel advanced materials. During his Fulbright Visiting Scholar Program in 2009, Hojamberdiev conducted research on the fabrication of porous glass ceramic materials with modified surface properties at the Alfred University in New York. Hojamberdiev is now sharing the valuable knowledge and broad experience he has acquired from his exchange year in the United States with colleagues and the academic community in Uzbekistan. Hojamberdiev is also a senior researcher in the department of natural and mathematic sciences of Turin Polytechnic University in Tashkent.